BikeBrampton loves convenient bike parking, right near the door, covered, and that fits all sizes of bikes (including baskets & trailers)! Image featured is the beautifully designed covered bike parking at the new Peel Memorial Centre, opening February 2017. 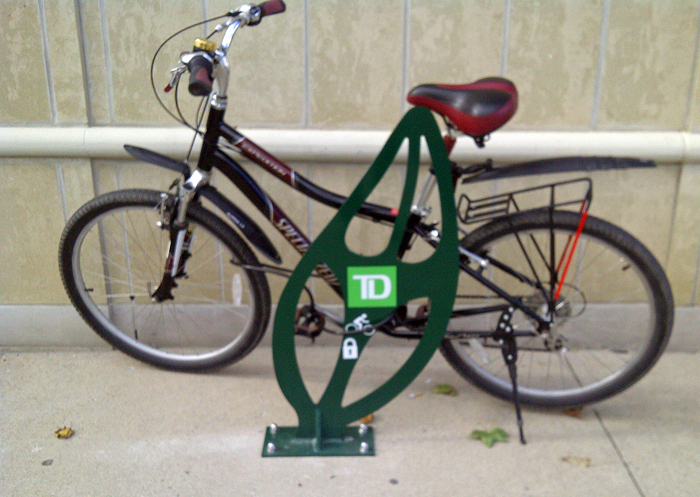 When a BikeBrampton member asked their Bank Manager if they would install a bike rack, a few months later, this elegant rack appeared outside TD Canada Trust, 150 Sandalwood Pkwy E. This is an excellent example of how to encourage active transportation in the community!